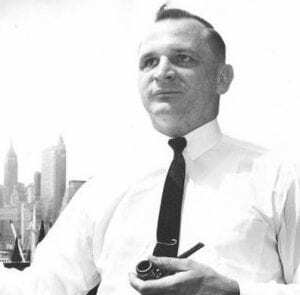 Robert J. Smithdas was the first deaf-blind person to gain a master’s degree when he graduated from New York’s St. John’s University in 1953. Born in 1925, Smithdas caught cerebro-spinal meningitis aged four and a half, and lost hearing and sight as a result. He became director of Services for the Deaf-Blind at the “Industrial Home for the Blind,” and at the Helen Keller National Center. I composed these poems because my heart sang them to me over the years – because poignant moods, or powerful emotions, made me crystallize my thoughts and feelings into verbal expressions. Sometimes inspiration was so spontaneous that the words came flooding into my consciousness and shaped themselves into song; but far more frequently I found myself searching through the labyrinthine meanings of language to find the most convincing words , and the most plausible rhythms, to serve as crucibles for my themes. Yet I always knew the intrinsic essence of the thing I wanted to express in a sonnet, or a lyric, or the nobler passion of blank verse. This is a clip from an interview theat Barbara Walters did with Bob Smithdas. Barbara Walters: The lives of the deaf-blind have changed remarkably since the era of Helen Keller. She was never able to live by herself without sighted help, never able to be independent. Barbara Walters: In spite of the good things Bob, what is the hardest part of be being deaf and blind? What is the most frustrating? Bob: At this stage of life, I am very used to being deaf blind, but I will admit that I miss not being able to see my friends’ faces or hearing their voices. Remember deafness takes you away from sound, from music. Blindness takes you away from scenes. But deafness takes you away from people. Robert Smithdas died in 2014. The photo of him above is the same as that at the back of the poetry book. Unfortunately, when an external contractor tagged all of our books, the #### people doing the task were so slap-dash that they place the tag neatly over the photograph. Please note, the chief U.K. deaf-blind charity is Sense. Michael Reed, (1913-99) was a psychologist, audiologist, and teacher of the deaf, and was the first educational psychologist in England to work with deaf children. He was employed at the Royal National Throat Nose and Ear Hospital, Gray’s Inn Road, London, from 1949-1961. He then moved to the Inner London Education Authority as Her Majesty’s Inspector for Special Education, with responsibility for deaf pupils. He remained there until his retirement in 1978, and then settled in Canada in 1989. Michael Reed was the author of the Reed Picture Screening Test (see below) and Educating hearing impaired children, published by the Open University Press in 1984. He had a long involvement with the NID/RNID. He was co-opted onto the NID Medical and Scientific Committee in 1956, then elected onto the Council of Management in 1957. He became Vice-Chairman of the RNID in 1972, and Chair from 1975-85. 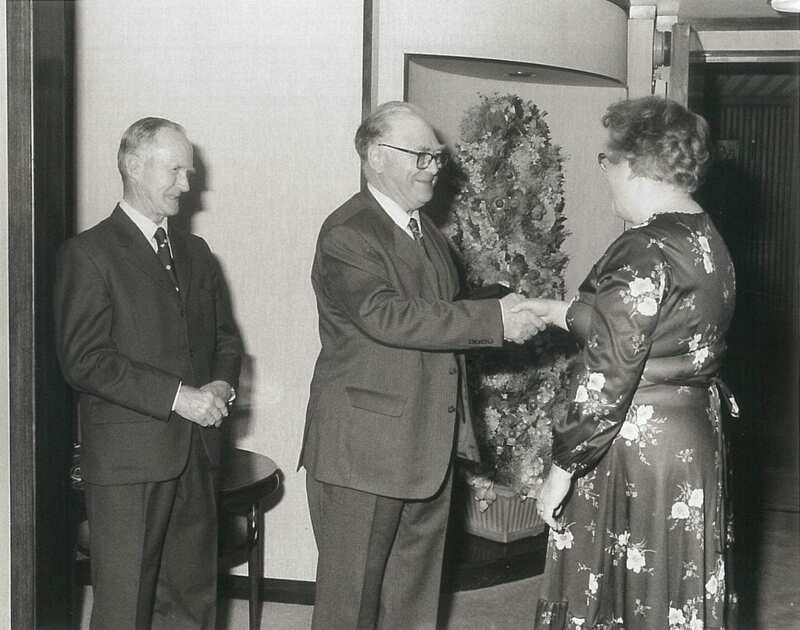 In 1986 he was awarded the OBE and created a Vice-President of the RNID for life. Here we see him in 1984, in the centre, flanked by Tom and Brenda Sutcliffe, from the then RNID magazine, Soundbarrier. 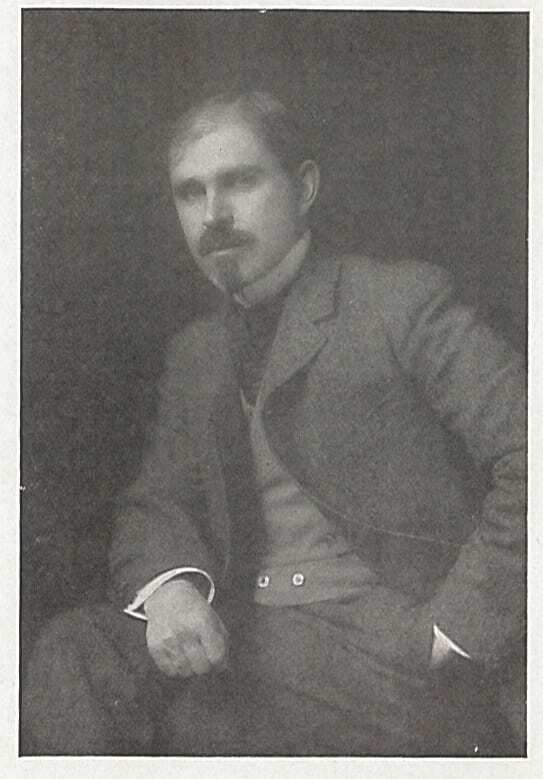 AKHURST, B.A. Michael Reed OBE 1913-1999. Psychologist, 2000, Jul, 2000, p.338. REED PICTURE SCREENING TEST FOR HEARING This was a set of pictures of everyday objects for screening primary school children’s hearing, devised by Michael Reed and published by the RNID in 1960. He uses the language of the time – ‘defect’ sounds uncomfortable to us now, and probably did in the 1960s to some. PICTURE SCREENING TEST OF HEARING By Michael Reed, B.SC. THERE IS NO DOUBT that the earlier a hearing defect is discovered the more the handicap caused by such a defect can be alleviated. The picture presented by severe or total deafness is all too obvious, but in the case of slight or moderate deafness, the picture is sometimes more obscure. Many children have been thought to be mentally very dull when, in fact, they have been partially or severely deaf. Frequently they had become frustrated and non-co-operative and therefore it had become difficult to establish the true facts. Many simple cases of deafness have been misdiagnosed because a complete understanding of the effects of distorted hearing or slight hearing losses has been lacking. Children with slight hearing losses which are not obvious may become educationally retarded in the adverse noise conditions of a class-room. Therefore it is extremely important to discover any significant hearing loss as soon as possible in order to be aware of the problem and so help the child. If there is a slight loss of hearing for all frequencies throughout the speech range, or severe loss for frequencies above 1000Hz, there will be some disability in discriminating between consonants. The R.N.I.D. Picture Screening Test has been designed around this simple fact. It is interesting to children and therefore fairly certain of ensuring their co-operation, and is easy both to carry around and to use. The test is made up of several separate cards each of which has four pictures. The names of the pictures conform with the following conditions. 1. The words must be monosyllabic so that the rhythm of that word does not give a clue. 2. The words in any one row must contain the same vowel sound. 3. The words must be those within the vocabulary of the children to be tested. The test as designed here can be used for children with a mental age of four years and older and with many children of mental age of three years. To ensure that the child to be tested knows the name of the picture, he is told how to name the pictures first, especially with very young children. If the child calls the owl a bird, one says ‘That’s right but I am going to call it an owl.’ Similarly if the hen is called a chicken, or the sheep a lamb, or the lamb a sheep, he is told that it is to be called a hen a sheep and a lamb so that the words do have the common vowel sound. If the child does not know any words then one cannot test in this way and if in doubt, a full audiometric examination must be requested. REED, M. A verbal screening test for hearing. proceedings of the 3rd World Congress of the Deaf, Weisbaden, 1959. Deutschen-Gerhorlosen-Bundes, 1961. pp. 195-97. McCORMICK, B. Screening young children for hearing impairment. Whurr, 1994. pp. 76-77. The story involves the boy Thomas, educated by l’Epée, (spoiler alert) who is really Julio, Count of Harcour. In the original French version, the Deaf boy uses gestures. “These gestures do not replicate the sign language de l’Épée taught to his students, but neither are they conventional theatrical gestures. 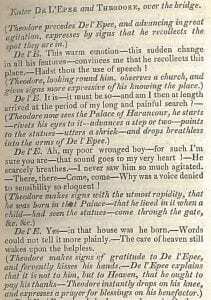 They are instead a hybrid: a theatrical gesture rendered so as to appear to replicate the manual language of the deaf as well as a transformation of de l’Épée’s manual language for the deaf into gestures that would work on a large stage” (McDonagh). Holcroft’s version seems to have the boy – played by Miss De Camp in the original – doing something more akin to pantomime – as we see here, “Theodore makes signs with the utmost rapidity” but it is hard to know exactly how that would have worked in the production (p.9). “In your opinion, who is the greatest genius that France has ever produced ?”. 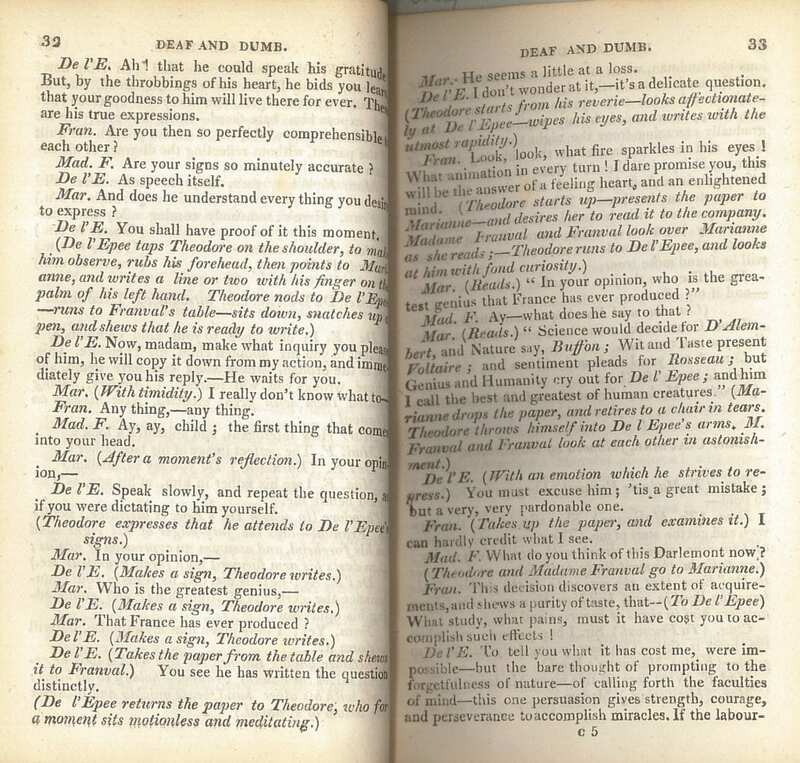 Marianne reads, “Science would decide for D’Alembert, and Nature say, Buffon; Wit and Taste present Voltaire; and sentiment pleads for Rousseau; but Genius and Humanity cry out for De l’Epee; and him I call the best and greatest of human creatures.” (Marianne drops the paper and retires to the chair in tears. Theodore throws himself into De l’Epee’s arms. M. Franval and Franval look at each other in astonishment. Mrs Kemble, pictured here, was the first Julio/Theodore in the English production. Last year while searching for something completely different, I came across the name Margaret Searl or Searle, around 1700, in Smithfield, London. She has a brief mention in the excellent book by C.J.S. Thompson, The Quacks of Old London (Barnes and Noble, 1993). She was the last of her family it seems, who had carried out a business near Pye Corner, which is where the Great Fire of London ended. 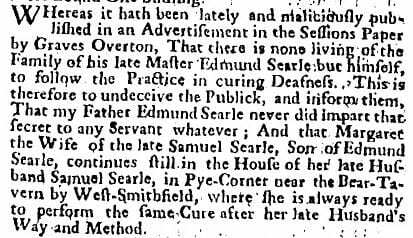 What we can glean from advertisements of the time, on Bills that survive and in contemporary newspapers, is that her father Edmund or Edmond, together with his nephew we must assume, Samuel, set up in business from at least 1668, ‘curing deafness.’ The first record I have come across for Edmund, is his burial on the 7th of July, 1695, at St. Sepulchre’s Church, Holborn, which is opposite the Old Bailey. His son, Samuel, was buried in the same church on the 17th of December, 1699. When Overton’s daughter Mary was baptised, on 17/12/1693-1694, he was living with his wife Rebecca on Snow Hill, just around the corner, and they were still there when his son John was born in 1696. Overton had married Rebecca Walserd in Temple Church, on the 25th of November, 1692. Overton died in 1704, and was buried at St. Sepulchre’s on the 4th of March. 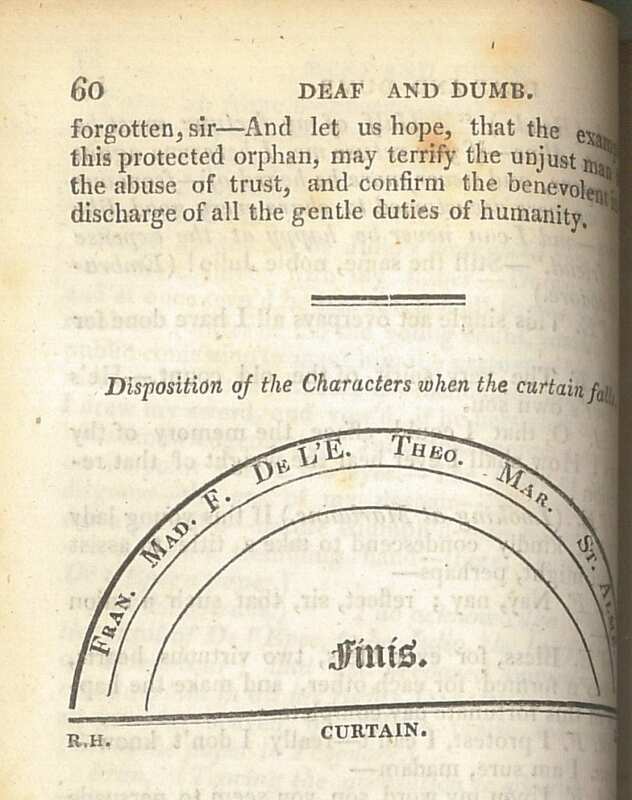 WHereas Graves Overton does put out Bil’s for Curing of Deafness; This is to certify all People, that Mr. Edmund Searl declared before his death, that he never did instruct him in that Art, especially being a Turn-over to him, nor any other of his Apprentices that were bound to him, if they would have given Two hundred Pounds down, as can be Attested by several Persons. Neither did Mr. Samuel Searl ever instruct Thomas Lamb, his Brother-in-Law in Curing of Deafness, nor any thing but a Barber’s Trade, nor any other Person but his Wife, who (being the Survivor of those two famous Men) lives still at the Old House in Pye-Corner, who practis’d with her late Husband Samuel Searl in his Life-time, and now does after the same Way and Method with good success. From this then we learn the not surprising fact that the Searls (also sometimes ‘Serle’) were barbers, the trade with which surgeons in England had a close association for 200 years. I wonder if he had any association with St. Bartholomew’s Hospital which is right opposite Pye Corner. At any rate, it is perhaps unfair to call them quacks as their deafness ‘cures’ were probably harmless, while a doctor of the time was far more likely to kill you. Margaret Searl[e] was buried in St. Sepulchre’s on the 29th of March, 1709/10, and what became of the ‘cure’ we can only guess! Post Boy (1695) (London, England), February 3, 1700 – February 6, 1700; Issue 753. Post Boy (1695) (London, England), March 12, 1700 – March 14, 1700; Issue 769. Post Boy (1695) (London, England), January 14, 1701 – January 16, 1701; Issue 901. This second post of this series highlights a small selection of reliable patient information resources for hearing loss in general. Once again, these sources either meet the NHS Information Standard or are produced by reputable organisations. · Get a hearing test as soon as possible if worried about hearing loss -the earlier hearing loss is picked up, the earlier something can be done about it. ENT UK, produced by the Royal College of Surgeons also has easy to understand information on ear anatomy and how the ear works to explain hearing disorders and common causes. Patient Info also has a range of pertinent information on hearing disorders and downloadable leaflets. Ermil, appeased, dries his tears. 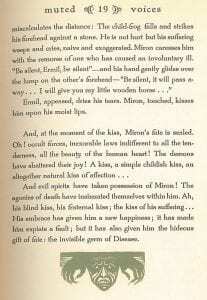 Miron, touched, kisses him upon moist lips. Relgis’ hero, while not unique, is not really representative of the deaf majority. The deaf Steppenwolf, the lone deaf outsider, is rarely encountered in real life in the United States. In Europe and elsewhere, for historical reasons there exists a sharp cleavage between deaf intellectuals and artists and the deaf man in the street, so that there such outsiders account for a much larger proportion of the deaf population. The book, and Relgis, are both worthy of closer inspection. 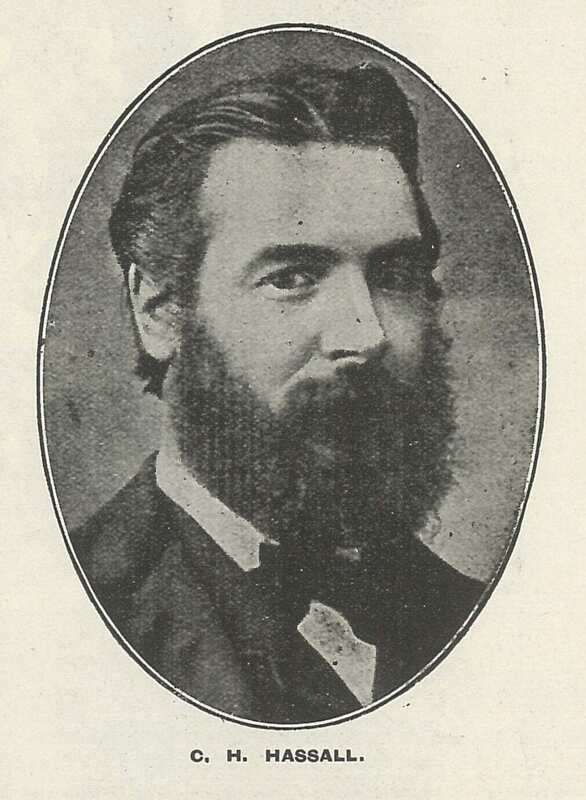 The herbalist ‘doctor’, Charles H. Hassall F.S.Sc. was born in Stoke in 1848, and in his youth he lived with his grandfather, who was himself a herbalist. As a boy Charles lost both his sight to some inflammation, and his hearing in his left ear, and partly lost hearing in his right ear. The interview in The British Deaf-Mute does not tell us if it was known exactly what caused that, but at any rate it was not permanent and he eventually regained hearing in his right ear, and his vision. A physician was consulted who professed to know all about it and prescribed accordingly, with the result that soon the inflammation rapidly spread to the other eye, still he continued to see and proscribe until I was completely dark-blind as it is called. He then very coolly gave up the case as hopeless, so I was to be blind through all my earthly life for all he seemed to know or care. No one can conceive the agony, the unutterable sorrow I was plunged into – an earnest, energetic mind just beginning to enquire and expand suddenly checked and held back in chains of darkness. Abraham tells us that some twenty-seven or twenty-eight years earlier, Hassall “had the rare and happy experience of being able to restore the speech of a young girl, with a a mixture of oils and various other ingredients. Abraham gives him the title of ‘doctor’ and says Hassall ‘had obtained many diplomas’ including The General Council of Safe Medicine Limited (Incorporated), London; The National Association of Herbalists of Great Britain; The Society of United Medical Herbalists of Great Britain; The British School of Eclectic Medicine; The British Association of Eclectics and Medical Botanists; The Medical Herbalist Defence Union Limited; The International Association of Medical Herbalists (p.189). One of these must be The National Institute of Medical Herbalists and it would be interesting to see if there are any archival records of him. The proliferation of diplomas and claim to use the title ‘doctor’ smacks of a desperation for legitimacy, but today we might term him a quack. He moved to Farnworth, Bolton, in 1881, which is probably where Earnest Abraham met him, when Abraham was a missioner there. He expanded his premises from 78 Peel Street to include 76 and 80. By 1911 he called himself a ‘Pharmacy Proprietor’ on the census, rather than ‘herbalist. Hassall died in Bolton in 1923.
nothing stands out with any sharpness, either teachers or lessons. A sort of mist seems to veil the next three or four years. He went on eventiually to college, and got good marks in mathematics, but otherwise, “For four years he sat in various classrooms, hearing almost nothing, content or at least resigned to make out a passable performance” (p.100). He got into advertising aged 23, when he won a competition for an advertisement for a Bissell carpet sweeper. 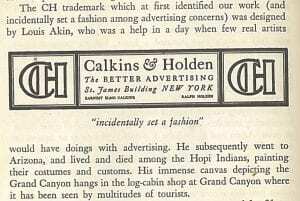 Later on his advertising company was behind ‘Lucky Jim’ of the breakfast cereal Force, and he introduced modern art into American advertising in the 1920s. “Lip reading is like handwriting in that it is sometimes as clear as print and again as illegible as Horace Greeley‘s famous chirography.” (p.189) He had lessons in lip reading with Edward B. Nitchie, who was deaf and whose books we have. We have the two volumes of memoir mentioned above. 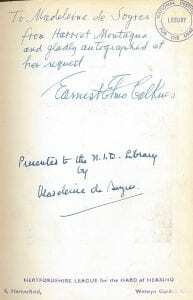 One is signed by Calkins, dedicated to Madeleine de Soyres. They are well worth investigating, and he seems to me an engaging writer. Born on the 2nd of February 1756, in Mougins, near Grasse in Provence, Jean Antoine Saissy had originally intended to become a planter, but coming across some medical books, he determined on a medical career, travelling to Paris to study (Montain, p.8ff). He was then twenty two years old, with only a village education, combined with his own book-learning (ibid.p.9). From 1777 to 1782 he studied under various famous professors, including Chopart and Pelletan. He went on to serve as a physician and surgeon major with the Compagnie royale d’Afrique on the Barbary coast. He attended to a child of the ‘Dey of Constantinople’ (possibly an error for Bey of Constantin? ), who wanted him to stay. 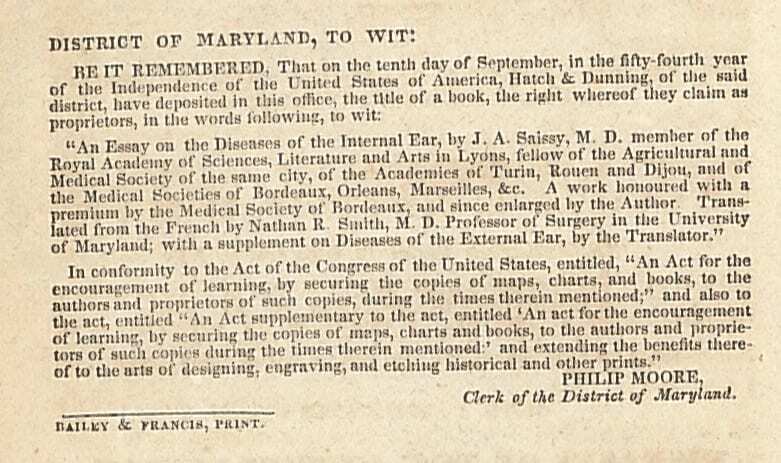 Saissy however, returned to France, and in 1789 (the English version says 1798 which seems to be an error) defended his thesis on inoculation for small pox before the ‘Chirugical College of Lyons,’ and became a Doctor of Medicine with the University of Valence. He married the daughter of M. Thenance, a doctor who had invented some obstetric forceps, and devoted himself to that area of medicine for a time. In 1810 he wrote an essay on Croup, one of the first to do so. 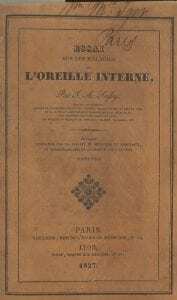 He seems to have been a polymath, in 1811 presenting at the Institut de France a ‘memoir’ on the extraction of light by the condensation of gas. Quite what that means I am not sure. He also worked on a study of hibernation, with dormice and marmots (ibid p.12 -13). In other words, it makes you deaf as well as blind! I suppose that he is not thinking of veneral disease, which can have those effects. Saissy died on the 5th of March, 1822. He seems to have been rather forgotten but is deserving of better treatment than I have space or time to give him here. 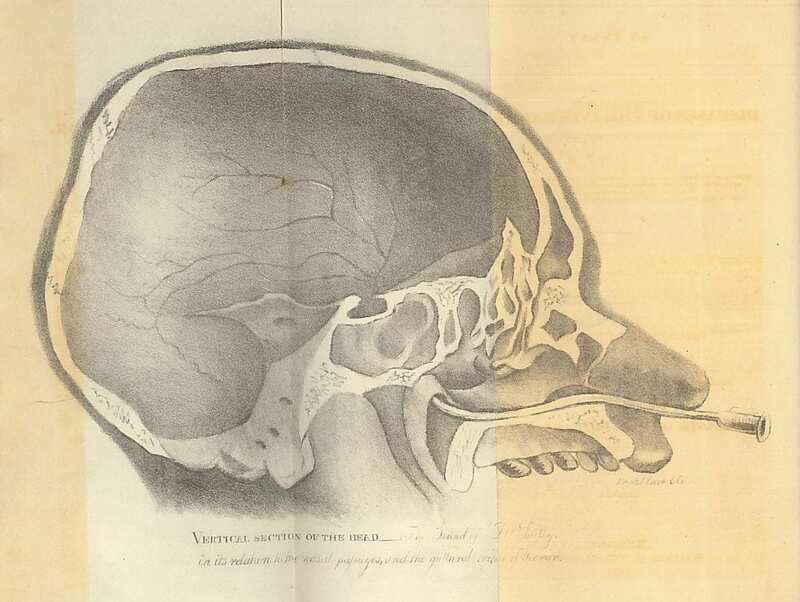 Above, the only illustration in his book, a section of the head showing it is a vertical section. As an addendum, it is interesting to note the protection of copyright notice given by the U.S.A. in the front of the English translation from Maryland. Montain, Biographic Notice, in An Essay on the Diseases of the Internal Ear, p.9-15. Weir, Neil, & Mudry, Albert. Otorhinolaryngology, An Illustrated History, 2013. 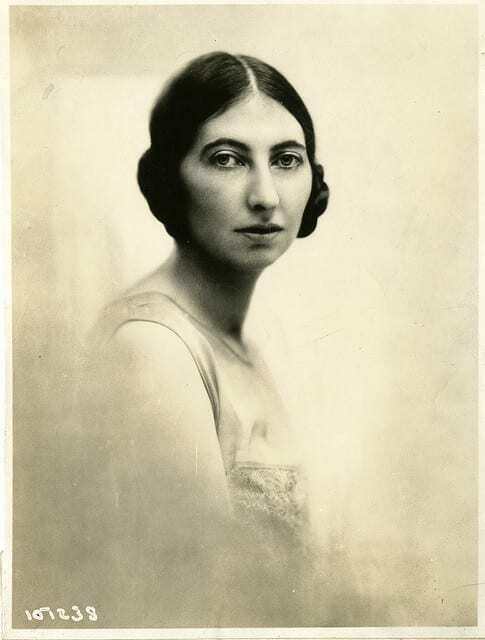 Margaret Kennedy (1896-1967) is today best remembered for her 1924 novel, The Constant Nymph. Her daughter, Julia Birley, was a novelist, as is her granddaughter, Serena Mackesy. You can read more about her on Wikipedia and in the Dictionary of National Biography. I could not have ventured to write this book without the advice and criticism of Miss Edith Whetnall and of Dr Pierre Gorman, Librarian to the Royal National Institute for the Deaf. I wish to thank them for their great kindness and for the trouble which they took to help me. 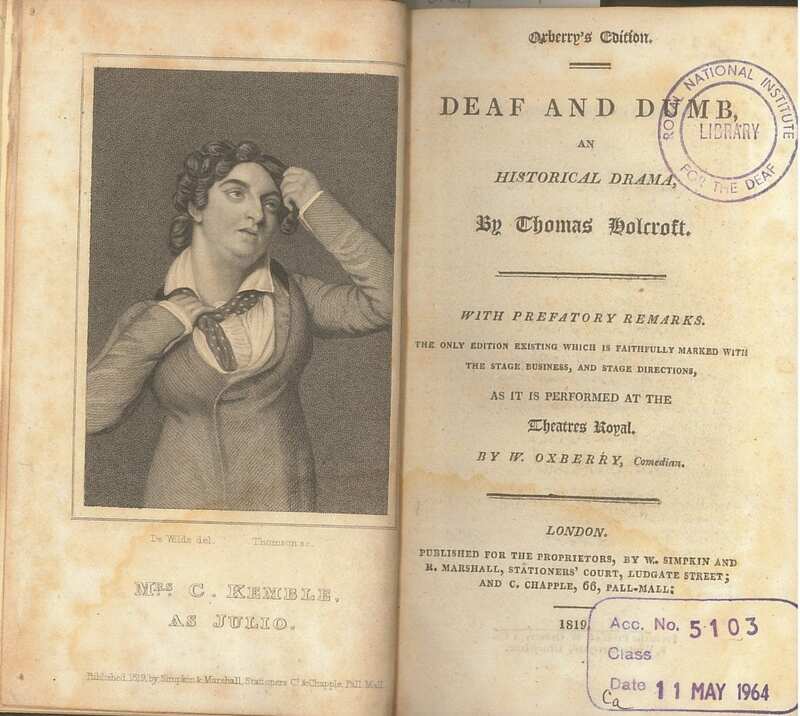 I cannot say this is the sort of novel that would excite me, but it may well be of interest to anyone studying Deaf people in literature, and is perhaps worthy of further examination. 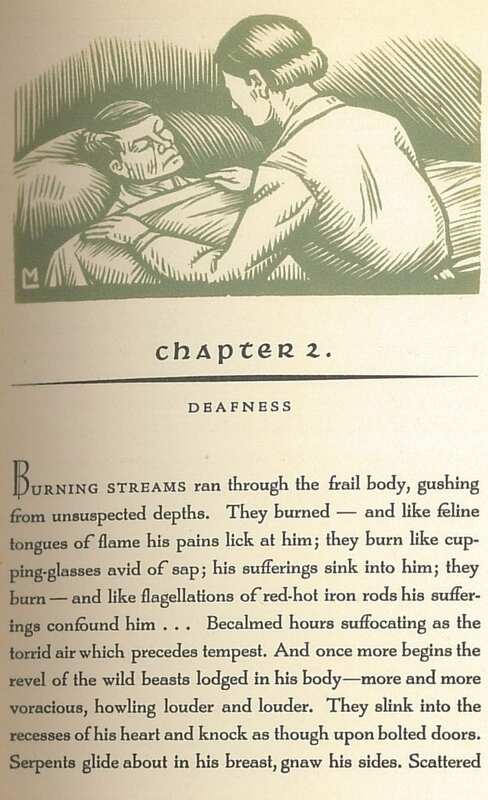 Kent, Deborah, In Search of a Heroine: Images of Women with Disabilities in Fiction and Drama. In Fine, M. A. A.. Women with Disabilities. Philadelphia: Temple University Press, 1989.